If you open an HTML file and click on the Designer tab, you will have the ability to drag and drop HTML elements on the designer surface. 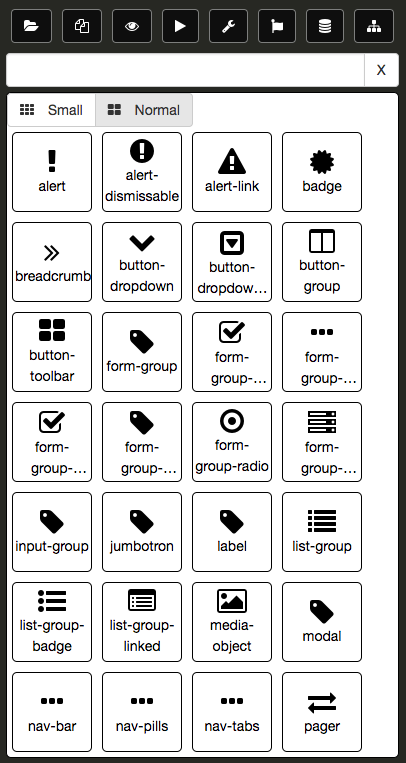 When working with Projects, there are several buttons that you will use. If the splitter is too small, you are able to scroll the buttons to the left or right. 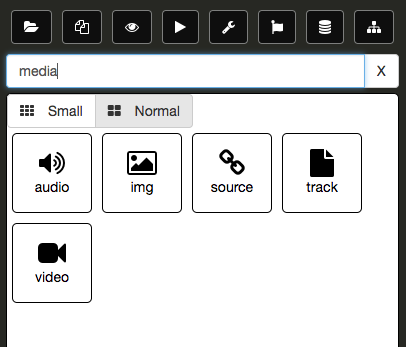 When you are working with HTML files and decide to use the Designer tab, the Navigation Panel buttons change. As you can see, we have the same buttons as before but we now have a few more. 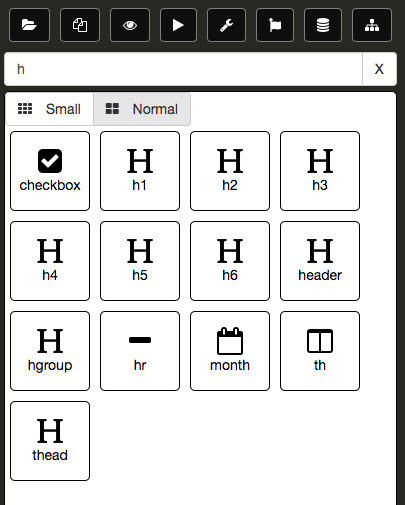 The Toolbox Panel gives us access to standard HTML elements. 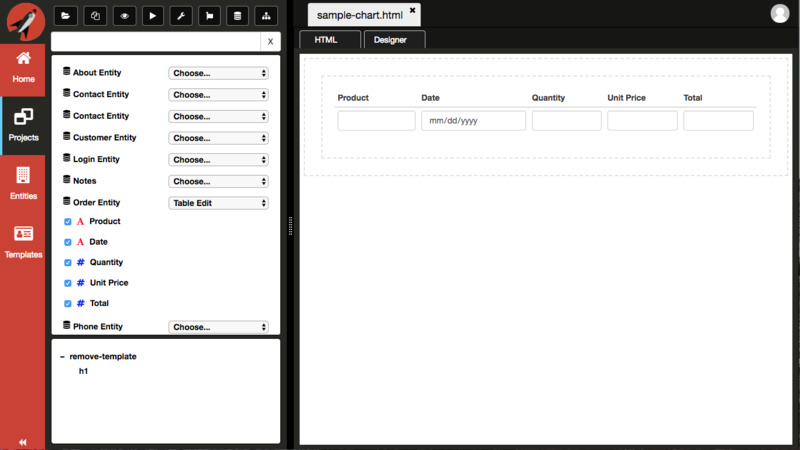 You can easily select an element and drag and drop it on the the designer surface. In the following example, we have selected a Button element and dragged it onto the designer surface. If you click on the Button element on the designer surface, the Navigation Panel will switch to the Property Grid displaying all relevant options you can set on the Button. You will also notice that you now have some more buttons in the top right corner. 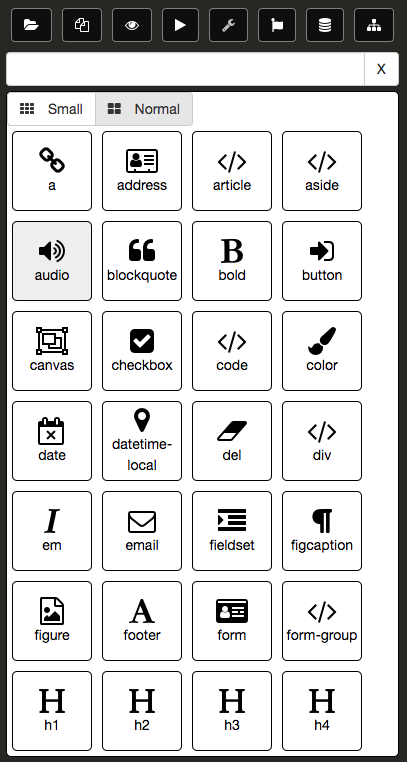 Take some time to play around with the Toolbox Panel and drag some elements to the designer. Currently bindings and events are only in the format for Aurelia. Now that we have topics, we will be able to extend the Property Grid to contextually change based on the repository topics defined. You can toggle between the Property Grid and the Toolbox Panel simply by clicking on the element on the designer surface. The Bootstrap Panel gives us access to Bootstrap elements. 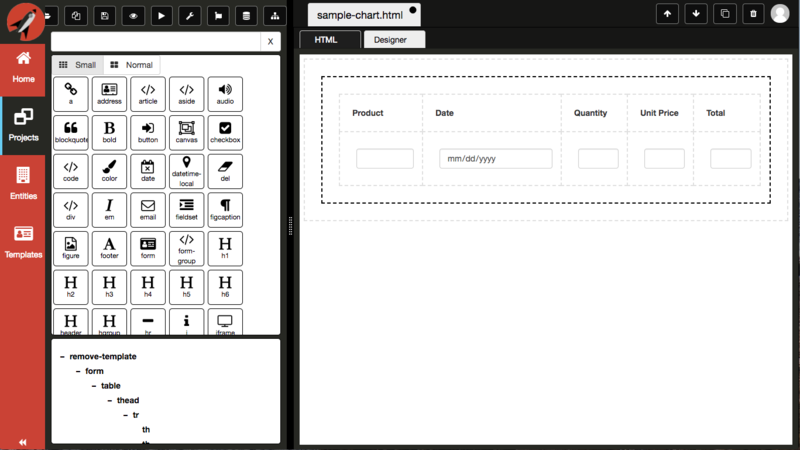 You can easily select an element and drag and drop it on the the designer surface. 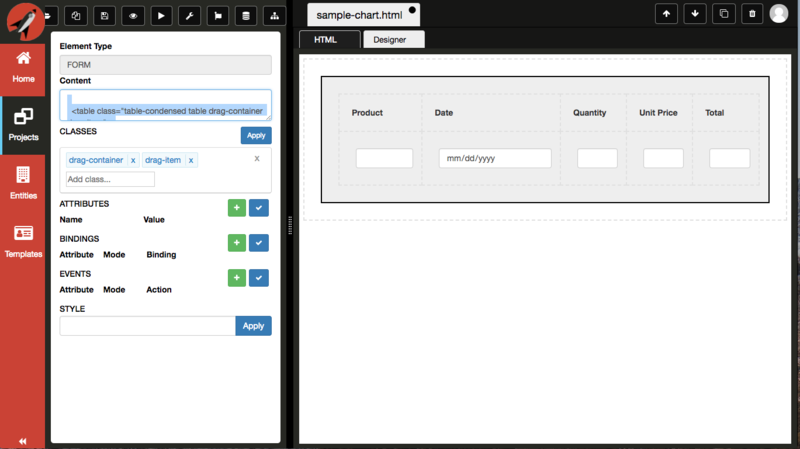 In the following example, we have selected a form-group element and dragged it onto the designer surface. 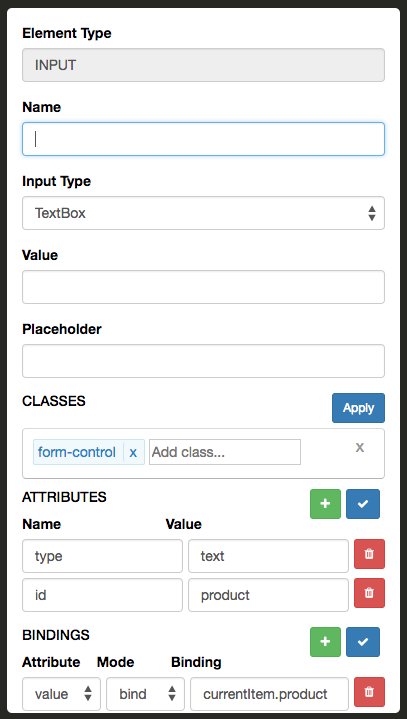 Again, you have the ability to select the form-group, which actually a DIV element with form-group class assigned to it, and move it around or adjust some properties. The Entities Panel gives you access to all of the Entities that you have authored from the Navigation Menu. The following is an example of a dragging an Order entity onto the designer surface as an editable form. 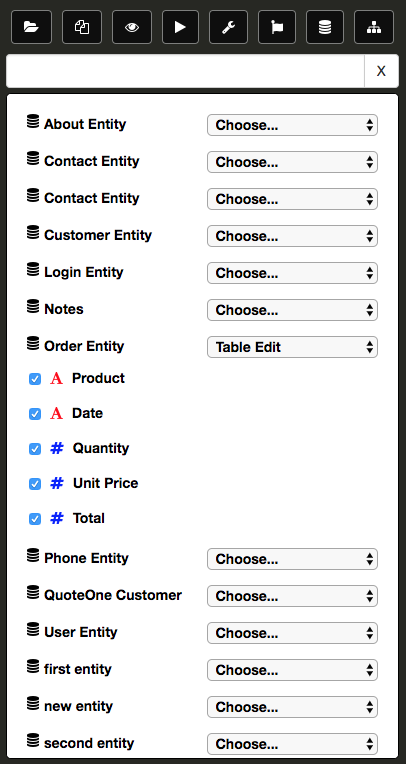 Here another example of dragging an Order entity onto the designer surface as an editable table. You can see that the designer surface shows that the form is being hovered. 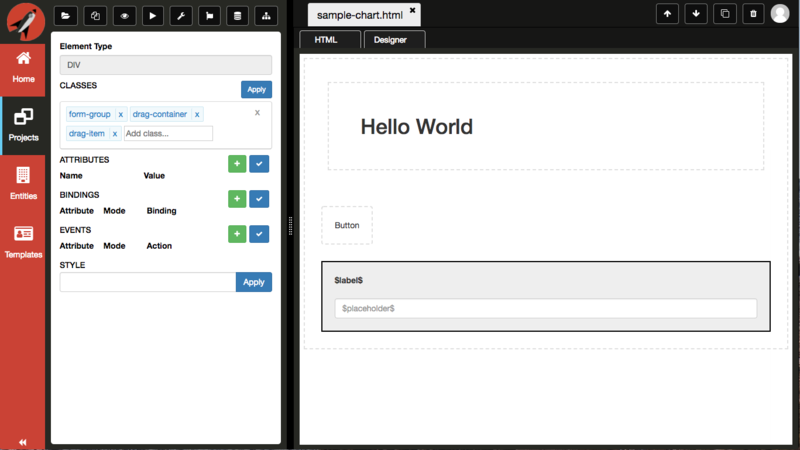 If you click on the form object in the DOM Tree, the same will be selected on the designer surface and the Navigation Panel will switch to the Property Grid. 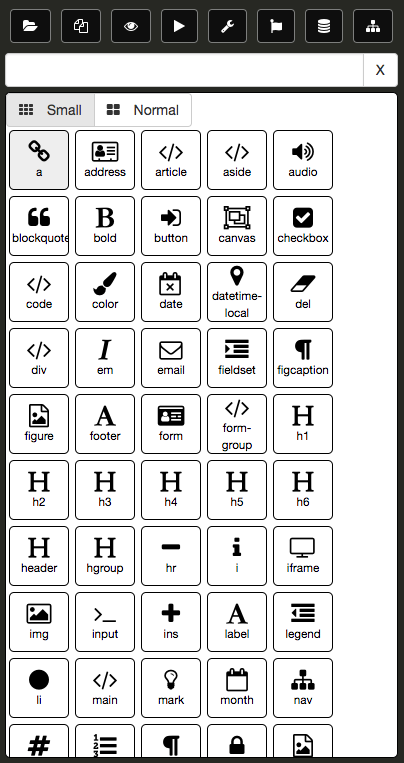 In order for the DOM Tree to update, you must toggle to the HTML tab and then back to the Designer tab. The DOM Tree Toggle icon allows you to collapse the pane so that you have more surface for the other panes. 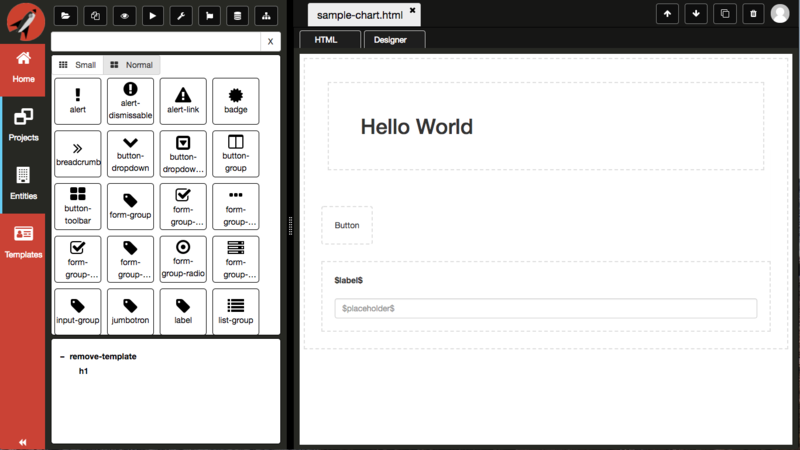 The Property Grid binds to the element selected on the designer surface. If the input element had a placeholder, you would see it in the Placeholder control. 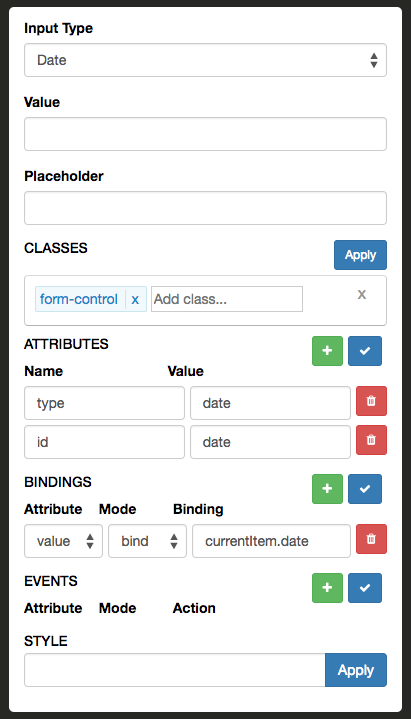 The Classes section is used to add and remove classes from a given element. You can either click in the control for a dropdown to appear or you can type a class in the input element. If you use the dropdown and select an element, you must click on the blue apply button to apply your changes to the element. Otherwise, you can simply hit enter in the input element to add the class directly to the selected element in the designer. The same is true when you remove a class or all the classes, you much click on the blue apply button to apply your changes to the element. You have the ability to add or remove as many bindings as you like. You must click on the blue check button to apply your changes to the element. Attribute - this is the attribute for which the event handler is associated with, e.g. &apos;click&apos;, &apos;keydown&apos;, &apos;change&apos;, etc. You have the ability to add or remove as many events as you like. You must click on the blue check button to apply your changes to the element. The Styles section is used to add and remove styles directly on a given element. You must click on the blue apply button to apply your changes to the element.